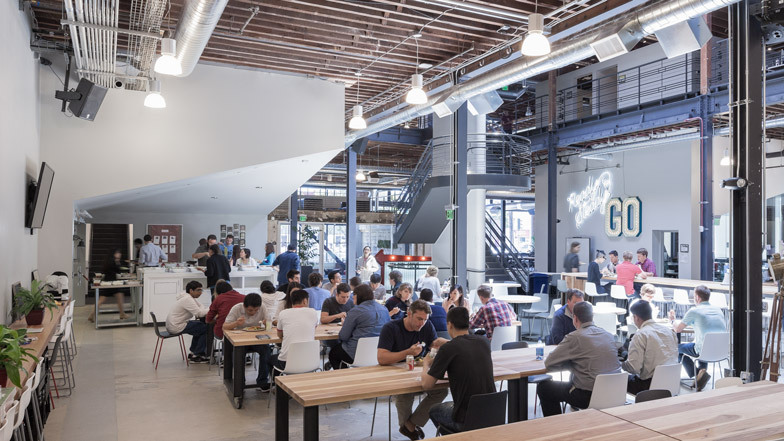 The new San Francisco headquarters for photo-sharing website Pinterest is housed in a converted warehouse filled with two-storey white volumes. New York designers All of the Above and Los Angeles studio First Office were originally asked to design an office for Pinterest's growing team of twelve. However they were called back by the social media company and told that its staff numbers were burgeoning faster than anticipated. "The company had exploded," said All of the Above, "Pinterest had tripled in size and the partners found a 45,000-square-foot warehouse in San Francisco that could easily fit 300 people." The designers added four white cuboids stretching from the floor to the roof of the former industrial space, connected by a steel mezzanine level used as an open-plan work and dining space. "Big volumes that we called houses create pockets within the open warehouse," said the team. "Different monumental tables would require for people to invent new ways of organising a meeting, occupying a war room, coming together for a collective lunch or throwing a party at the bar." Each house serves two functions, for example, one includes a transparent meeting room on the ground floor and hosts a bar for the staff canteen on level above. Circular and rectangular tables were purpose built for different types of meetings. Flexible desk arrangements and service areas fill the spaces surrounding the enclosed volumes. The white and glass surfaces can be used as white boards, pinboards and graffiti walls for employees to share ideas. Internet companies often opt for adventurous office interiors. Evernote's workspace includes staircases with built-in seating and Google's base in Tel-Aviv is filled with orange trees. We also recently reported that Frank Gehry is to design Facebook's headquarters in London and Dublin. When we first met with Pinterest, it was to discuss their office in Palo Alto. There were 12 people in the group, but they were growing quickly. Evan and Ben, Pinterest's founders, asked us to design an office environment that could reflect their unorthodox character and growth. Our response was through monumentality. Rather than buying a desk for every new engineer, we proposed one large table that would reach maximum capacity over a long period of time. It measured 32' x 32', and could easily fit sixty people. The table went into production, when we were called in for another meeting. The company had exploded. Pinterest had tripled in size and the partners found a 45,000-square-foot warehouse in San Francisco that could easily fit 300 people. They wanted a space that would be in a perpetual state of creation. No matter how big the company got, designers and engineers would feel encouraged to contribute their best ideas, to fill in the blank, to decorate, destroy, and exhibit again. We understood, that like the website itself, the office environment would have to offer an abstract framework within which collaborative, social, and emotional relationships could begin to form and transform the architectural space. "Habituation devours works, clothes, furniture, one's wife, and the fear of war. 'If the whole complex lives of many people go unconsciously, then such lives are as if they had never been.' The technique of art is to make objects 'unfamiliar', to make forms difficult, to increase the difficulty and length of perception because the process of perception is an aesthetic end in itself and must be prolonged." With these thoughts in mind, we designed a catalog of strange objects. Big volumes that we called "houses" would create pockets within the open warehouse. Different monumental tables would require for people to invent new ways of organising a meeting, occupying a war room, coming together for a collective lunch or throwing a party at the bar. Even the most democratic, circular table, in inverse, would become a lock-down room for engineers on a deadline. All around, white and glass surfaces would turn into white boards, pinboards, and graffiti walls. The domestic interior would grow thick with objects, sketches and ideas formed through social contact. We placed four houses into the warehouse, forming at its centre a big, gathering space and at its edges a thick infrastructural corridor with service spaces that are variously expansive and compressed. We hope people will see opportunity here to chat with their coworkers, go deep into their work, enjoy the heat of the sun or a darkened room, and let the blood rush to their heads.